ODIN is made possible through the help, input, and work provided by others. Therefore, this project is entirely open source and available to all to use/modify. All this developer did was assemble the tools, convert some of them to Python 3, and stitch them together into an all-in-one toolkit. Harvesting email addresses and employee names for a company. Linking employees and companies to social media profiles. Checking to see if discovered accounts have been a part of any public security breaches or appeared in any pastes. Collecting data on domains and IP addresses from Shodan, Censys, DNS records, and whois/RDAP. Discovering subdomains, their related IP addresses, and looking for CDNs that might allow for domain fronting. Hunting Office files and PDFs under a domain, downloading them, and extracting metadata. Linking key words, like a company name or domain, to AWS via S3 buckets and account aliases. ODIN requires Python 3. Using pipenv for managing the required libraries is the best option to avoid Python installations getting mixed-up. Run pip3 install --user pipenv or python3 -m pip install --user pipenv. Run cd ODIN && pipenv install. Run pipenv shell to get started using ODIN. Uninstall virtualenv, pipenv, and pew. Review the keys.config.sample file to fill-in your API keys and create a keys.config file. cd into the /setup directory and run setup_check.py to make sure your keys.config file is in order. Install awscli and run aws configure. ODIN uses several APIs to gather information. Some of these require an API key, but most of the APIs are free. That is to say, you can get a free key and then pay for more requests/day. Shodan is a good example of this. You may prefer to not use APIs at all for one reason or another. You can still use ODIN, but a few of the APIs are just really fantastic and you should consider using them, specifically Censys and Shodan. Both of these services are used to collect data on domains and IP addresses. This includes attaching domains to IP addresses, identifying the network CIDRs for these addresses, and pulling information about the owners. No API key is needed. The Robtex free REST API is used to collect domain names tied to IP addresses. This information is displayed alongside the RDAP information for IP addresses, so you can see what else is hosted at that IP address. Shodan is used to search for domains and lookup hosts (IP addresses). This pulls in information like open ports, banners, hostnames, and location data. Shodan also flags hosts for well known vulnerabilities like Heartbleed. This data is recorded as well, if it exists, but does tend to be outdated (or just wrong) a lot of the time. Censys is very much like Shodan, except less information about open ports/services is available. However, Censys provides a way to search for certificates tied to a domain. This can be a lot of data, but you may find new hosts, like those tied to an employee's email address and used for a VPS in the cloud. URLVoid offers reputation data for domains, including Alexa and Google rankings, domain age, and location data. It also keeps track of domains that have been flagged for malicious activity by various entities (e.g. Fortinet, Avira). This may be the most "skippable" of the APIs, but some of the data can be useful and worthwhile. It's included for those occasions. If you setup a Twitter app for ODIN, the tokens can be used with Tweepy to collect account data (e.g. real name, location, follower count, and user description) from Twitter profiles ODIN has linked to the target organization. In the future, this may be used to collect analytics from Twitter to help you find very active users or get a profile of them. Become a Twitter developer by going to dev.twitter.com and then create an app on apps.twitter.com. eSentire's Cymon is used to check domains and IP addresses to see if the target appears in any of Cymon's collected threat intelligence feeds. This is used for reputation checks, but also used in combination with urlcrazy to check similar, registered domains to see if the domain or the domain's A-record IP addresses have been reported. Note that appearing in a threat feed doesn't mean something is wrong or that Cymon has bad data. A domain may have been used for phishing, been detected and seized, and is now dormant with the old malicious A records. Then you have things like cloud service IPs that change hands often. Events like that can lead to a domain or IP being used for malicious activities one day and safe the next. Always investigate these findings before crying wolf to your client. Email addresses are checked against HIBP to determine if any email addresses for the organization have been mentioned in any pastes or been involved in any security breaches. DNS Dumpster is a cool project you can find at dnsdumpster.com. Subdomain information is collected from DNS Dumpster, including a neat domain map image! ODIN will check NetCraft for domain history and known subdomains. This does require a web driver for Selenium. If you download a driver and provide the path to it in your keys.config file (Yes, this isn't really a key, but so be it), NetCraft searches will be kicked off automatically when you perform domain OSINT. The Chrome web driver is recommended, but the Firefox/Gecko driver should work just fine, too. Meant for marketing folks to find leads and contacts at a company, this service offers free API keys for harvesting their contact information organizaed by company/domain. Hunter will return names, email addresses, phone numbers, Twitter handles, LinkedIn profile links, and job titles. Full Contact support is implemented only for their Company API at the moment, but support for the People API may come in the future. For now, this is used to build a company profile based on a target domain, such as the client's primary domain used for email and their website. Full Contact catalogues everything from website info and company logo(s) to website blurbs and social media profiles. It's likely Full Contact will get some things wrong, such as number of employees. In my experience, the data is usually not too far off the mark, but the profile is only meant to act as a snapshot to get you started. Yes, Amazon Web Services. ODIN will perform recon against AWS to find things like S3 buckets and accounts names and aliases. Account names are strings of numbers, so you will need some idea of what you're looking for there. Aliases, however, can be anything, like a company name, and those can be validated as existing or not. By default, ODIN uses the client (-c) name and domain (-d) for searches. ODIN will search for the name with spaces stripped out, the domain with the TLD, and the domain without the TLD. Then ODIN will add some common suffices and prefixes, like "downloads-" or "-apps" to these keywords. Optional wordlists can be provided for additional keywords and 'fixes. Keywords can be anything, really. Consider assembling a list of related words, alternate client names, etc. An Amazon and awscli are required. ODIN will search for Digital Ocean Spaces just like it searches for S3 buckets. Spaces follows the same standards as S3, so it is simple to verify existing Spaces. I get this syntax error. What's the deal? Please make sure you are using Python 3, not Python 2.7 or earlier. I recommend using pipenv. I get an error when ODIN tries to import a library. What's wrong? Like above, please make sure you are using Python 3. 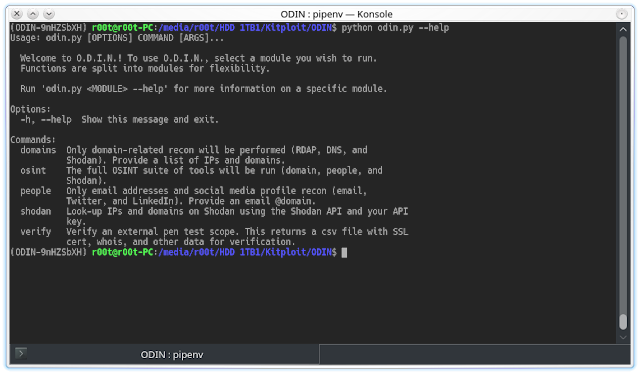 ODIN must be run in Python 3 and the requirements must be installed using pip or pip3 for Python 3. To make sure all required libraries are installed for Python 3, use pipenv and the provided Pipfile. The Pipfile enforces Python 3, so you should be good to go. See the installation instructions at the top. Why do you not like "why not" questions? If you have a suggestion for a change, service, or API, please explain what it does and provide some details explaining why you think it would be a good addition. Why not add support for the Clearbit API? Clearbit looks useful for OSINT, but the free tier is restricted to 20 API calls in a month. That may even be 20 API calls for the life of the account. The details are unclear. Either way, that's very restrictive and I want ODIN to be as simple and free to use as possible. The paid tiers are quire expensive. Wappalyzer is useful, but it's very difficult to automate fetching the results from Wappalyzer. Some tools can do this, but they use an unmaintained package called wappalyzer-python (https://github.com/scrapinghub/wappalyzer-python). This package still works, as far as I know, but there are several problems with it. The package has not been updated in three years, the developers have stated they have no plans to change that or support wappalyzer-python, and the package is Python 2. It could be used until it breaks one day, but the Python 2 bit is the real sticking point. Why not add support for the BuiltWith API? Like Clearbit, BuiltWith is a neat resource and some interesting details can be reviewed on the website. The API, however, is not free. The free version of the API won't give you any details, so at best it can be used to highlight a domain you may want to then review on the BuiltWith website. Scraping the website search results is certainly possible, but that could easily break and/or be unreliable. Adding support for BuiltWith hasn't been ruled out, but the goal is to make ODIN entirely free to use. Why not use Full Contact's People API? Currently only the Company API is used. There are plans to incorproate the People API in the future. Does ODIN perform DNS brute forcing? No, but it is being considered. However, brute forcing can take a long time and there are many tools that take care of this quite well. Those tools are not so easy to incorporate into ODIN without just running the commands for those tools. For subdomain discovery, it's hard to beat Aquatone right now and there's alwas Fierce and DNSRecon. For now, ODIN leverages DNS Dumpster, DNSRail, and NetCraft to collect subdomains to get you started. I don't have X API key, can I still use ODIN? Absolutely. If an API key is missing from the keys.config file, any checks using those keys will be skipped. You are strongly encouraged to go get the free API keys to get the most out of ODIN, but you can skip any you don't want. Ninjasl0th - Creator of the original scope verification script and all around cool dude! 0xF1 - Architect behind Cymon and a great guy to have on your team! GRC_Ninja - For providing great feedback regarding HTTP requests and RDAP. Troy Hunt - For giving me permission to use HaveIBeenPwned's REST API in this way. Laramies - Creator of the awesome TheHarvester. Daniel Grzalek (Dagrz) - Creator of aws_pwn and the reason why I was able to build out AWS recon options. TrullJ - For making the slick SSL Labs Scanner module. Added support for detecting oportunities for DNS cache snooping. Added a new option to provide a wordlist of terms to be used as prefixes and suffixes for S3 bucket hunting. Added Pipfile to replace requirements.txt and avoid conflicts with Python 2.x installs. Finally updated the URLCrazy module for the SQLite3 database change. Converted the old XLSX reports to a SQLite3 database solution! Implemented multiprocessing (!) to greatly improve efficiency and shorten runtime! Various other little bug fixes and tweaks.